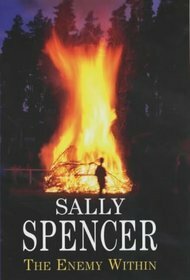 Sally Spencer - A pseudonym used by Alan Rustage.Sally Spencer is a pen name, first adopted when the author (actually called Alan Rustage) was writing sagas and it was almost obligatory that a woman's name appeared on the cover (other authors like Emma Blair and Mary Jane Staples are also men).Before becoming a full-time writer, he was a teacher. In 1978-79 he was working in Iran and witnessed the fall of the Shah (see the Blog for what it was like to live through a revolution). He got used to having rifles - and, one occasion, a rocket launcher - pointed at him by both soldiers and revolutionaries, but he was never entirely comfortable with it.He lived in Madrid for over twenty years, and still considers it the most interesting and exciting city he has ever visited, but for the last few years he has opted for a quieter life in the seaside town of Calpe, on the Costa Blanca.His first series of books were historical sagas set in Cheshire (where he grew up) and London. They were very popular with his English readers, but his American readers find the dialect something of a strain.He has written twenty books featuring DCI Woodend (a character based partly on a furniture dealer he used to play dominoes with) and ten (so far!) about Woodend's protegé Monika Paniatowski. His DI Sam Blackstone books are set in Victorian/Edwardian London, New York and Russia, and the Inspector Paco Ruiz books have as their backdrop the Spanish Civil War. Alan is a competitive games player who likes bridge and pub quizzes. It is only by enforcing iron discipline that he doesn't play video games all the time.He now lives on Spain's Costa Blanca.